Tall Ships 2012 is over. For future opportunities please see the 2019 voyage programme. In 2012, John Laing will be joining the fleet for Race 3, from La Coruna, Spain, to Dublin, Ireland - a fabulous, not-to-be-missed adventure voyage between two of the liveliest ports you could wish to visit. We are also offering two very special cruises immediately before and after the race, to get John Laing to Coruna and home from Dublin. Both these cruises are designed so that particpants get some time in one of the Tall Ships festivals and a chance to join with activities and see the other vessels. The Tall Ships series brings together sail training vessels crewed by young people aged 15-25 from all over the world., ranging from the largest square-rigged vessels, through a wide range of traditional boats, to the Class C vessels, like John Laing, which are yachts with a more modern rig. 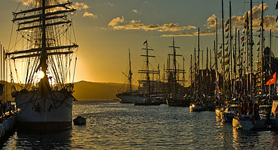 The host ports of a Tall Ships series traditionally lay on superb hospitality for visiting crews, with festivals, entertainments, a wide range of activities and a chance to see other vessels and visit the town itself. These are some of the most adventurous voyages of John Laing's season, and taking part is always an unforgettable experience. For official Tall Ships voyages or other voyages starting and finishing at Tall Ships festivals, the age range for John Laing's crew members is 15-25. We take both male and female crew, and no previous sailing experience is required - all we ask is that you bring enthusiasm, a willingness to join in, learn new skills and work together with the rest of the crew. Spanish Festival Cruise: 1-12 August 2012, Plymouth to La Coruna (Spain), 11 nights, £780pp plus travel, age 15-25 (or possibly available as an 18+ mile-building voyage). Sail to the festival in this lively Spanish port, join the celebrations and events in Spain, and see the Tall Ships gathering before the race! Provisionally fully-booked. Race 3: 12-25 August 2012, La Coruna (Spain) to Dublin (Ireland), 13 nights, age range 15-25. £950pp plus travel. Provisionally fully-booked. Irish Festival cruise : 25 August - 1 September 2012, Dublin (Ireland) to Plymouth, 7 nights, age range 15-25. £525pp plus travel. Provisionally fully-booked. Spanish Festival Cruise: 1-12 August 2012, Plymouth to La Coruna (Spain), 11 nights, £780pp plus travel, age 15-25 (or possibly available as an 18+ mile-building voyage). 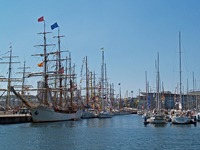 Cross the Bay of Biscay, join the celebrations and events in Spain, and see the Tall Ships gathering before the race! Provisionally fully-booked but we will take names for a reserve list in case any bookings are not confirmed. Please contact the office to make a provisional reservation, or to ask any questions. 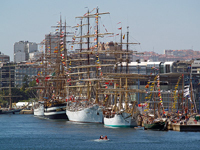 La Coruna has hosted some of our all-time favourite Tall Ships festivals and we can't wait to go there again! It will be an amazing experience for John Laing's crew members, joining hundreds of other young people from all over the world for a fantastic programme of events and activities. 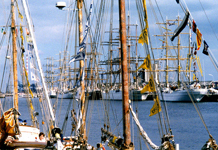 On leaving La Coruna, all the vessels take part in a parade of sail. On board John Laing, new crew members will be learning the basic skills needed for the voyage: everyone on board will become an important member of the team during the race. Once the vessels cross the start line, the fleet heads south and west, to race up the beautiful west coast of Ireland. The vessels will spread out over a wide area, as everyone searches for the best weather and sailing conditions. Twice-daily radio schedules tell us where we are in relation not just to the rest of the fleet, but perhaps more importantly, in relation to other Class C vessels, against whom we are directly competing. 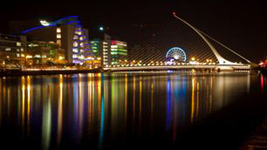 The race ends in time to enjoy another spectacular festival in Dublin. Availability tbc - it depends on whether or not all provisional reservations are confirmed. Please contact the office to ask any questions. Irish Festival cruise: 25 August - 1 September 2012, Dublin (Ireland) to Plymouth, 7 nights, age range 15-25. £525pp plus travel. The crew for this voyage will arrive in time to enjoy the festival in Dublin before setting off for a cruise back to Plymouth - where we go on the way depends on the weather, but if we are lucky then the aim would be the Scillies..